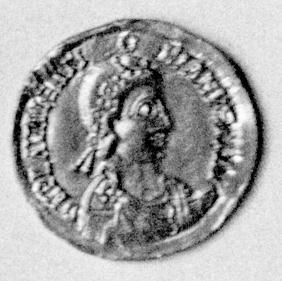 Obverse: Diademed, draped and cuirassed bust of Valentinian III right, wreath above head. Legend and bust enclosed within wreath around edge of coin. 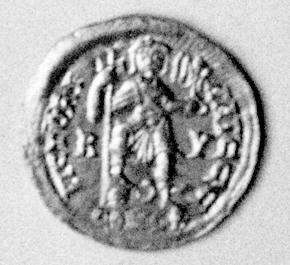 Reverse: Emperor standing facing, holding long cross and being crowned with an open wreath by a less-stylized(?) Victory on globe held in left hand. Places right foot on head of human-headed serpent with an open coil.